So one of my fellow Media Studies MA candidates who is in my Media Industry Perspectives class this semester started a web series called "Must Love Robots" about a young man who is trying to find a date for his roommate who just so happens to be a lonely robot. The two live together in Brooklyn and have created a blog where they are posting all of the webisodes. I found it completely adorable and also quite hilarious. Trust me, it's not one of those inside joke things where one has to know the person for it to be funny. It's genuinely awesome. Be sure to scroll to the bottom and work your way up to watch the videos in the correct order. 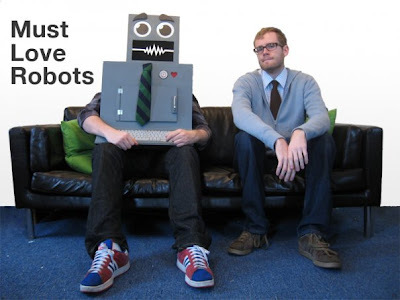 In tandem with the blog they have also created a Match.com-esque website called Robot Friend Finder where one can create their own character profile (mine is an android who goes by the same name as her human counterpart). Be sure to watch the introduction video before you actually enter the site below; it's equally as clever as the actual web series. If you find that this web series is something you'd like to continue watching the in future, you can become a fan of them on Facebook or follow the characters on Twitter. That is pretty nice of you, 011iver and I could use all the help we can get.